In the last few omnibuses from the Standaard Uitgeverij, we’ve seen Rocket get into heaps of trouble, again and again. Nonetheless, he was given a second chance to redeem for his mistakes, by doing jobs for the intergalactic government, and thus repay his debt for the damages he did. 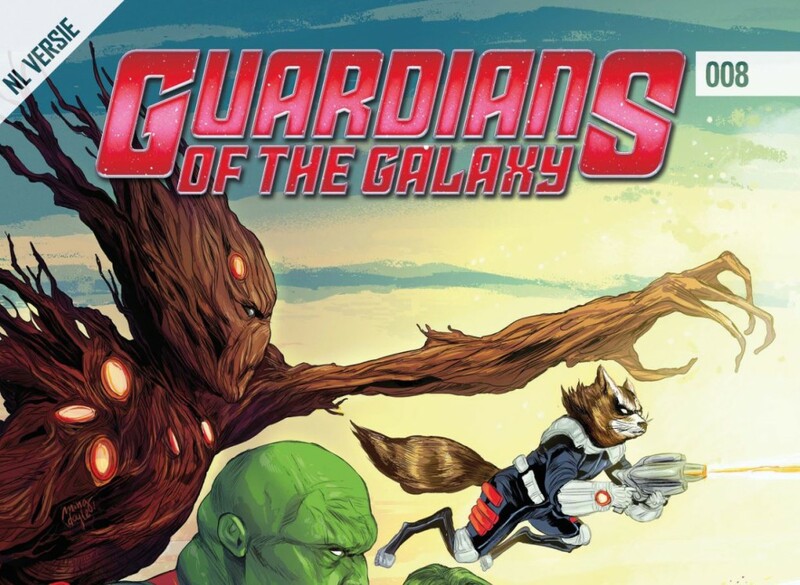 Again we find Rocket in the lead of this new bundle of issues of Guardians of the Galaxy, and we still love seeing the walking and talking raccoon making choices that don’t always add up, especially seeing he should better lay low until he has fully repaid his debt. Rocket has collected the last batch of money he needs to pay off his debt and finally be rid of those pesky jobs he has to perform, allowing him to properly return back to the rest of the team. Nonetheless, even though he only has a few hours left to pay off the remaining balance, he gets an offer from one of his old shady associates which might lead Rocket to the whereabouts of the book of the Halfworld, which may contain answers of who created Rocket, and if there are any others like him, he starts doubting what he should do. He decides to aim for easing his conscience and skips out on paying back the government, which makes him a wanted raccoon once again. Again the bulk of this issue will revolve around Rocket, his mistakes, his wild life and of course his moping about his existence. Other than that, there’s a very short story about Gamora, which serves as a fun intermezzo. The flow is rapid, yet lighthearted, which suits the talking mammal quite well, making sure you’ll be able to enjoy this fairly carefree story in one breeze. Illustration wise, things are done in a very cute and light fashion, making the story lose its rough edges, making it a pleasant experience for both young and old. The first portion of this issue works a lot with flashy colors, while the last portion aims for very cute and rounded facial features and ‘thicker’ features for all characters. The Gamora side-story has more realistic drawings, which lift up the very short story. Guardians of the Galaxy #008 is another fun issue that puts Rocket Raccoon in the lead of the story. We can easily say we still haven’t tired of this Rocket saga, and we’d still love to learn more about this weary, yet sneaky, member of the Guardians of the Galaxy. While still not many answers are given about what Rocket truly is, we hope we’ll get the answer one day. Moons of Madness – Upcoming horror game by Funcom! Bomber Crew – New DLC out now!